Makeover: The Compliments Lifted My Spirits for Days! 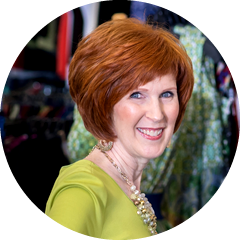 A couple of years ago Jane attended my ‘Your Style, Your Way’ workshop and took what she learned and ran with it! She says, “I immediately went home after the workshop and cleaned out my closet of clothes that were ill fitting or the completely wrong color.” I was very impressed! 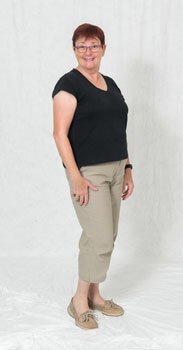 The one thing you can see about Jane, even in her before picture is that she has spirit! She is 63 and an ovarian cancer survivor and when you meet her you can’t help but be attracted to her exuberant energy. What is most important for her (and the reason she attended the workshop) is that she didn’t feel like her wardrobe, or the way she expressed herself visually, was reflecting that. Jane is also one of those people who can wear black, but it can have a tendency to dampen her spirit visually when she does. But color is a different story! That is where it’s at for Jane. Believe me, not everyone can pull off this color, but Jane can! The warmth in her hair, skin and eyes and her irrepressible spirit love this color. Like so many women I meet, Jane does not always love to shop or cannot always find things she loves when she does. After we shopped together she shared, “Buying new clothes with the help of Ginger was transformative and the most pleasurable experience I have ever had buying clothes.” And, we had fun! One of the things that many women struggle with is the question of age appropriateness of some of the trends. To wear or not to wear, that is the question. So, you can imagine that Jane was shocked when I suggested she wear leggings. Really, she said! Many women can wear leggings that come to the ankle with a top that ends at or a few inches above the knee…even to mid-thigh. Women with heavier calves or very full thighs can struggle with this look (feeling like all the focus goes to that part of their body) so don’t worry if it doesn’t feel right for you. While not every trend is for everyone, it never hurts to try it on to see. You can always take it off if you don’t like the way it looks. Hint: when you try an outfit with leggings be sure you add the shoes or boots you’ll wear. If you try on leggings with ankle socks and sneakers you’ll hate it. Jane’s intrepid spirit and zest for life makes this outfit an obvious choice! While Jane is wearing a cool pair of high heels with this outfit, she could also wear a knee high black boot (whether flat or with a heel) as long as it is sleek to her leg. Part of what inspired Jane to join the photo shoot is the fact that she was about to attend a high school reunion and wanted help choosing an outfit. If you have ever attended a school reunion (or decided not to go because it felt so overwhelming to figure out what to wear) you will appreciate Jane’s next comment. “I recently went to my high school reunion wearing an outfit put together by Ginger. The compliments and ‘WOW, you look great!’ lifted my spirits for days.” This is what I wish for you, too. Keep your spirit high and your mind open when it comes to choosing your wardrobe. The key is to find your perfect looks that reflect your inner essence so getting dressed is a joy not a chore. Jane also very kindly expressed, that, “Ginger’s knowledge and enthusiasm for helping women to bring out their natural beauty is a talent that is not found everyday.” Thank you, Jane. I am blessed to get to do something I love every day with fabulous women like you! *Inner Beauty Words: Each of my clients gets 4 personal inner beauty words. I have worked with hundreds and hundreds of women and no two have had the same 4 words. This is no surprise since each woman has an inner essence that is unique to her which is part of what makes it so exciting to help each of my clients find the wardrobe that makes them feel amazing. 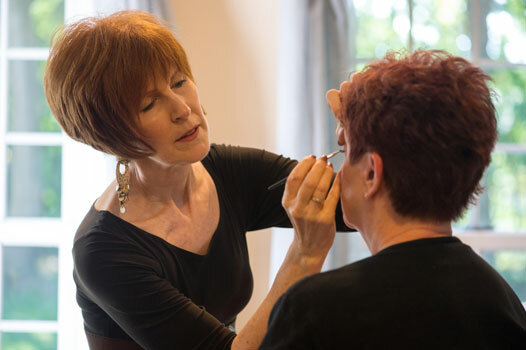 Annie McGonagle – you’ve seen Annie in many of my videos and she assists me in the ‘Your Style, Your Way’ workshop. She added her amazing ‘joyously unrestrained’ essence to the experience for everyone! Annie has a great eBay business so check out her finds here. And, I did her makeup. A Note About the Clothes: All of Jane’s after outfits are vegan/cruelty-free including the shoes, accessories and even the makeup. Please note that I am passionate about ending animal suffering and choosing cruelty-free clothing is just one aspect of a vegan lifestyle. If you have any questions about being vegan please let me know. I am happy to help and will answer any questions with kindness and compassion.